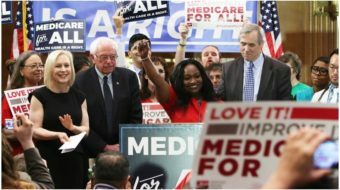 NEW HAVEN, Conn. – The fight to protect and expand Medicare and Medicaid heated up across the country this week as the heath care programs for seniors and low-income individuals turned 49. Spearheaded by the Alliance for Retired Americans, the week included community celebrations to protect and expand Medicare as well as protests at offices of Republican members of Congress who want to turn Medicare into a voucher program and increase the eligibility age. The Dixwell/Newhallville Senior Center in the heart of this city’s African American community was filled with a turnout on Wednesday for a birthday celebration. Co-sponsored by the Connecticut ARA, the event, complete with birthday cake, featured presentations from representatives of every member of the state’s congressional delegation. 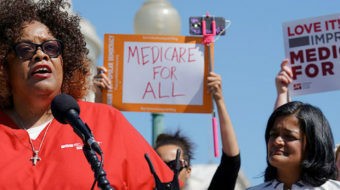 “With the passage of Medicare, no longer was health care a privilege but a right,” said Rep. Elizabeth Esty, a Democrat representing the state’s 5th congressional district, in a message to the event. “Medicare cannot be reduced to vouchers. No one should have to choose between food and medicine,” she emphasized indicating the fierce fight underway in Congress. Connecticut’s 5th CD race is one example of the high stakes in this year’s election for which party will control the House and Senate. Esty, completing her first term, is being challenged by highly funded Republican Mark Greenberg, who attacked her for voting against Republican Rep. Paul Ryan’s budget. That budget contained severe cuts to Medicaid and other health care programs. Two days earlier across town at New Haven’s Atwater Senior Center a bilingual roundtable was convened by Democrats Rep. Rosa DeLauro and U.S. Senator Richard Blumenthal to roll out their Patients Bill of Rights, co-sponsored in the Senate by Sherrod Brown of Ohio to fix problems with Medicare Advantage that allow providers to put profits before people. The bill was drafted with the help of doctors and patient advocates in Connecticut after United Healthcare, the largest Medicare Advantage provider, summarily dropped 2,200 doctors from their rolls leaving 32,000 seniors stranded. Among other measures, the new legislation would require Medicare Advantage insurers to accurately inform patients at the time for enrollment of the doctors who will be available. The fight for Medicaid has become intertwined with Republican obstruction of the Affordable Care Act. Republican governors in 23 states have opted out of ACA’s Medicaid expansion, denying thousands of people health care. Rep. Elijah Cummings of Maryland and ranking Democrat on the House Oversight Committee sent letters this week to the governors of North Carolina, Florida and Texas, demanding an explanation. A quarter of residents in Texas are uninsured, higher than any other state. If Republican Gov. Rick Perry agreed to participate in Medicaid expansion under ACA, 1.2 million people would gain health coverage. Also this week, North Carolina’s “Moral Mondays” activists, led by Rev. William Barber, went to Washington, D.C., to protest the impact on poor people and rural hospitals in states where the government has refused to expand Medicaid. He joined Adam O’Neal, Republican mayor of Belhaven, who walked 270 miles to the nation’s capital to protest the closing of Vidant Pungo Hospital in his town. 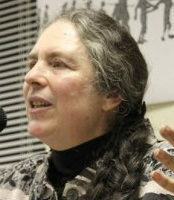 In a number of cities, supporters of Medicare for All legislation, HR 676 introduced by Rep. John Conyers, D-Mich., also held information and lobbying events on the occasion of the 49th birthday, highlighting the continuing need for single payer healthcare beyond the Affordable Care Act. When Medicare and Medicaid were signed into law 49 years ago, half of all seniors and most individuals with low income, had no health coverage. Today, 52 million seniors are covered by Medicare and 60 million people are covered by Medicaid. 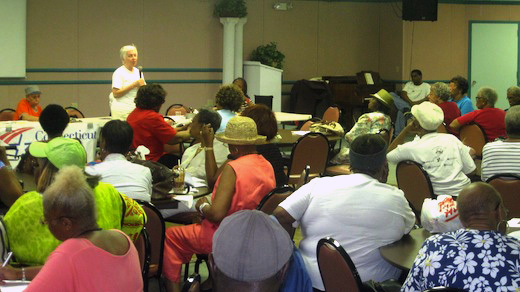 Photo: Bette Marafino, president of CT Alliance for Retired Americans, addresses the 49th birthday of Medicare celebration at the Dixwell/Newhallville Senior Center in New Haven, Connecticut July 30. Art Perlo/PW.